bungalow furniture & accessories: I love this Entire Book! I love this Entire Book! 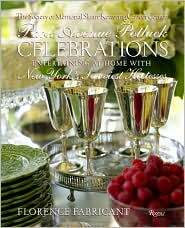 This book is full of entertaining and menu ideas for any celebration or season! Beef Stroganoff in a New York Minute! Heat the oil in a skillet over medium heat. Add the onion and mushrooms and sauté until they barely start to brown. Add the meat and cook, breaking it up with a fork, until it has lost its pink color and is evenly crumbly. Remove from the heat. Melt the butter in a medium saucepan over medium heat. Whisk in the flour, cook a minute or so, then gradually whisk in the stock to make a creamy sauce. Season with salt and pepper and whisk in the mustard. Pour the sauce over the meat and mushroom mixture. Reheat briefly and check the seasoning again. Set aside. Bring a large pot of salted water to a boil for the pasta. Cook the noodles or fettuccine according to the package directions and drain well. Place in a large warm bowl. Reheat the meat mixture and fold in the sour cream. Spoon the meat over the noodles, garnish with the dill, and serve.